Maria E Ignatieva, Perth. Anna Bubnova, St. Petersburg. Green roofs are becoming more popular around the globe and are considered to be a very progressive landscape design devise in urban areas. The green roof has started to become fashionable—it is even considered as one of the “compulsory” sustainable buildings features and an important part of urban green infrastructure. For example in Germany and Sheffield building companies are requested to establish green roofs on new buildings. In the last two decades, the technology of creating green roofs has become standardized. The most popular today are extensive green roofs with a thin substrate layer and several succulent drought tolerant species such as Sedum and Sempervivum. These plants have become among the most popular because of their low cost, simple installation and basic maintenance. The Sedum green roof industry is quite established in the US, Canada, Germany, UK and Scandinavian countries. In Germany it is estimated that 25% of rooftops are covered with green roofs. However, the commercialization of green roof technologies and mass production is leading to homogenization of green roofs—they all look the same, with a limited number of Sedum species—and a decrease in their ecosystem service potential. The Sedum green roof’s main function is runoff regulation and is not particularly effective in serving as biodiverse biotopes due to the homogeneity of plant material. The most recent trend in ecological design is creating biodiverse green roofs that can be seen as a valuable urban biotope and substitute of the lost terrestrial habitat during building construction process. In this sense the Scandinavian vernacular experience of green roofs can be a very valuable foundation for modern researchers and designers. Scandinavian turf roofs of the 20th and 21st centuries can be assumed as the historical analogue of modern extensive green roofs. 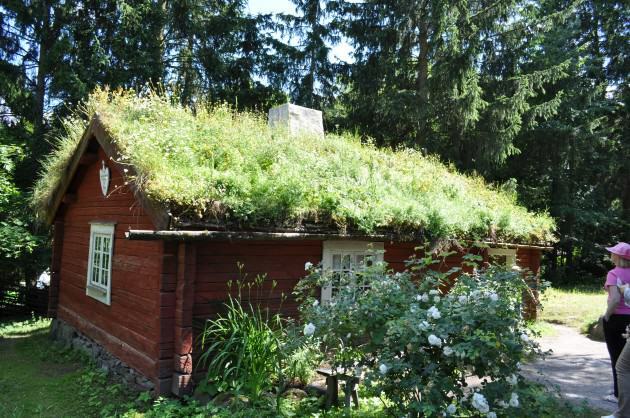 Turf roof or “torvtak” (in Swedish and Norwegian) is a traditional roof type of Scandinavia. 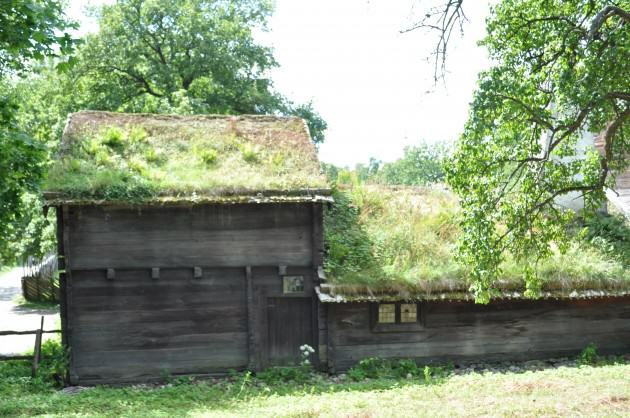 In contrast to an ecological and esthetical purpose of vegetation on modern green roofs, turf was supposed to be a strictly utilitarian and to protect the waterproof layer made of birch bark sheets. 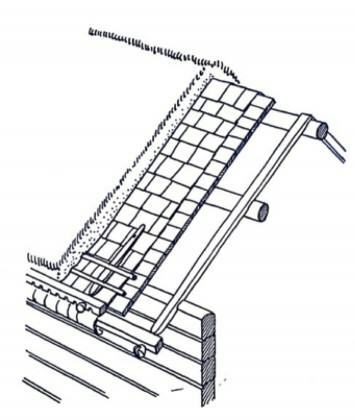 It was the common way to construct roofs for timbered houses in Scandinavia up to the end of the 19th century. A similar roof type was used for the Far East vernacular houses in order to protect them from the rain damage. 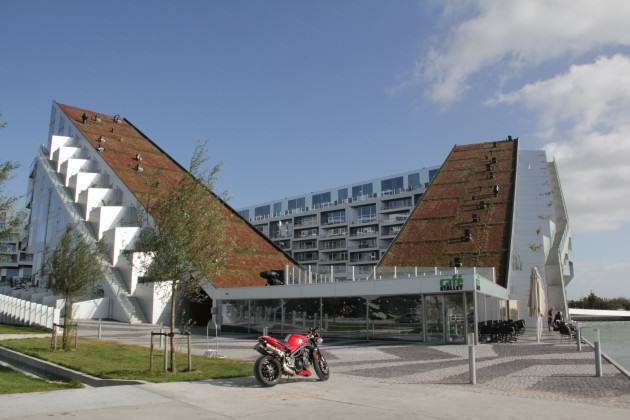 The technology of Scandinavian turf roof implies the construction of several layers with broad sheets of birch bark laid on roof surface made of wooden planks. Two layers of natural sod are laid on the birch bark sheets. 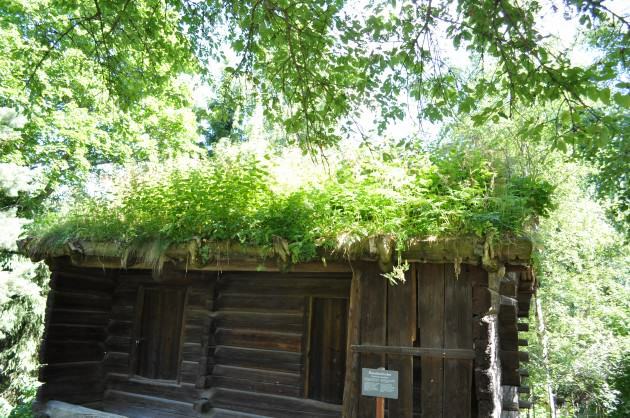 In Sweden the turf was simply cut from the meadows or forest margins and placed on roofs. The load from a roof was about 250 kg per m², which contributed to the shrinkage of wooden logs. Winter weight of the roof could reach 400-500 kg per m² because of snow. In addition, the turf had insulating properties, which was another advantage in a cold climate. The technology of such green roofs is quite simple. Wide sheets of birch bark are stacked on the sloping roof of the boards in several layers. Turf is laid directly on the bark in two layers. The first layer is laid back up to the dead grass so it can serve as drainage. The second layer is laid on this first layer. Eventually the roots from both layers bond together. A layer of bark served an average of 30 years, and then it had to be replaced. Since the materials for the construction of sod roofs can be found all over the place, construction was not costly. Construction was carried out by the family or with the help of neighbors. 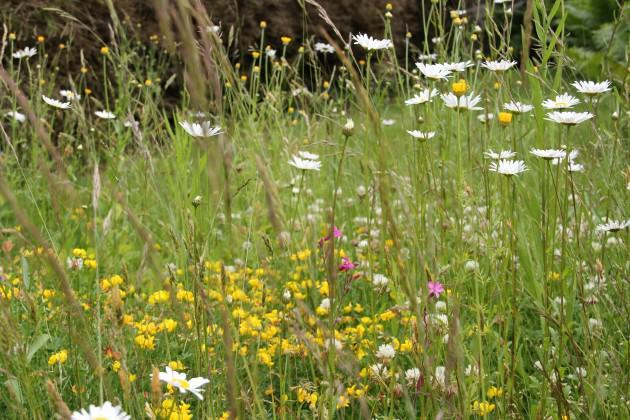 Meadows had, and have, very high biodiversity and this particular point makes old experiences so valuable for modern landscape design practices. These native turfs perfectly reflect the “genius loci”, which is the main motto for searching in modern landscape architecture practice. Turf roofs include a high variety of native meadow plant species. They are ideally fit to local climatic conditions. Torvak is a very attractive place for invertebrates, a variety of insects (including beetles, spiders, ants and bees), and some birds. Even though today in Scandinavia Sedum green roofs are dominant type, there is growing tendency to use biodiverse green roofs. The main supplier for traditional green roofs in Sweden is “Pratensis” nursery. This firm is specialized in growing herbaceous seed mixtures from local genetic material for biodiverse green roofs and alternative lawns (meadow like plant communities). We researched several traditional Torvak in Stockholm (Skansen Open Air Museum) and Uppsala (Disagården Open Air Museum). These green roofs were established around 40 years ago. The aim of our research was to develop a plant compositions and recommendations for the creation of sustainable plant mixtures for nurseries for different light conditions and orientations of the roof slope. We found 76 species of higher vascular herbaceous plants. Our observation leads to the conclusion that the similar green turfs, which were harvested in the same habitats but placed on the roofs with different microclimates, are going through several stages of ecological succession. The nature and speed of these changes depend on the light conditions, the presence of trees in the immediate vicinity that create shade and reduce air flow through the area. There was quite clear division on “open” and “shadowed” green roofs where the differences in plant compositions were quite distinctive. Based on our research we recommend quite a long list of plants for sustainable biodiverse green roofs. We also established an experimental biodiverse green roof in the summer of 2012 at SLU Campus in Ultuna, Uppsala. 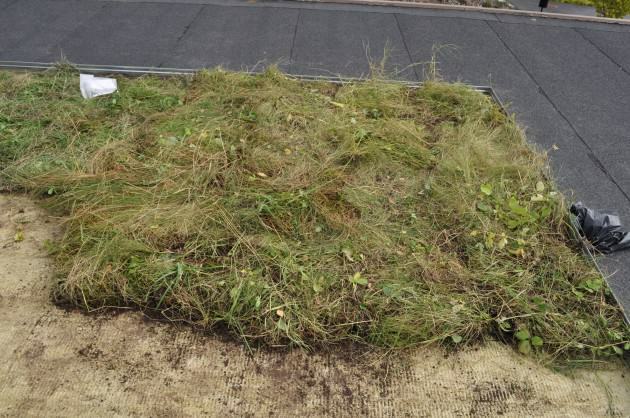 Cut turf from different native plant communities from the Uppsala area was placed on the roof of two story building. There was no watering or any other maintenance operation with these plantations. Exceptionally hot summer of 2013 contributed to the loss of most grass species. However there were quite a few perennials and annuals successfully outlasted this draught, then flowered and produced seeds. Experimental green roof in July 2014. In modern conditions it is not advisable to use the cut turf from native meadows as it was in past time even in the countries such Sweden or Russia with available native plant communities. In absence of watering and maintenance the original native composition can be changed quite quickly and does not fulfill the desirable functions (including decorative appearance). The most effective and economic way is using rolled biodiverse turf from special nurseries. Our research here begs an important question: how can designers and ecologists find, in each bioregion, ecological communities that would be appropriate for biodiverse green roofs, and apply them to the right structural engineering. Then we could develop a paradigm for locally-sourced, native-species, biodiverse roofs everywhere. 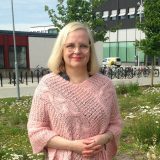 Anna Bubnova is working on an investigation of Green Roofs from the perspective of biodiversity and sustainability and completing her PhD thesis. Thanks for the great article and examples. What Christine mentioned about the technique used in Switzerland is very good. I think it is important to remember that in nature, the plants are largely responsible for the soil that is made; as the soil evolves, so does the flora, which makes for a constantly changing diversity. I use a very simple technique here in Brasil with a cut dried grass base which I plant into then cover again with dry grass and organic fertilizer. I plant during the rainy season and use micro sprinklers when necessary, but the dry season has a nice controlling action on the diversity. The roof slope is important, but you don’t need soil; the plants make their own. I don’t use Sedums. You wrote: “In Germany it is estimated that 25% of rooftops are covered with green roofs.” Now I don’t know who gave you that figure but it is totally unrealistic. 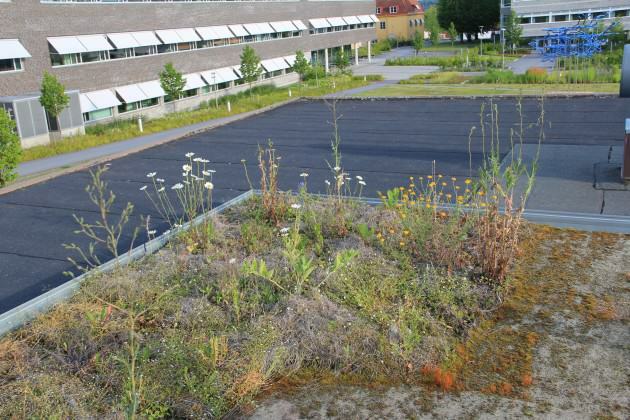 Maybe a FRACTION of ONE percent are “green” roofs in Germany as of 2014 (not counting reed decked roofs in Friesia and other Northern provinces which though are not alive (except for micro-organisms in them). Not even the photovoltaic panels amount to 25% as yet (and in fact, the photovoltaic craze has let green roofing come to a complete standstill as there is a pecuniary incentive to produce solar electricity while green roofs require extra strengthened beams etc.). You can easily check this by going to Google Maps. And of the fraction of that fraction of a percent roofs that I have seen a lot of them were actually dysfunctional and rather barren as that sedum and other monocultures do not really grow well without occasional maintenance. But hardly anyone visits their flat roofs regularly unless there’s a leak. And that fraction of a percent won’t change much in the near future as a) photovoltaic panels are preferred for at least twenty years due to subsidies for “green” energy and b) older roofs just are not strong enough to withstand the extra load of soil. In fact many roofs have to be cleared of snow in strong winters to prevent collapse in Germany (q.v. the flat-roofed ice rink that collapsed years ago and killed several skaters). Great read. In my experience (12 different countries) success is determined by the use of local materials. Our internal trials and record keeping shows our projects thrive vs simply live with the media recipes that mimic the geographic region. We use a higher percentage of organic matter, we also implement our bioSoil which is a consortium of nitrogen fixing bacteria recreating a living media. This approach works well with both our intensive and lightweight applications. Without data I would speculate the traditional green roofs with birch bark and other layers of organic matter sustained the roof for the noted 30 yrs by supporting the natural beneficial bacteria, look deeper and Im sure there will a worm or two in addition to other members of the “living Soil”. Nice article, Anna, as well! Sorry to have missed you in my post. Neat experiment in Uppsala, with the cut turf. From the image, it appears that the turf sample was it simply left in the corner of a flat roof. If this is so, it was likely given the toughest conditions imaginable, with exposure not only above but from the sides, too! Have you heard about the work in Switzerland, where a substrate of topsoil is overlain on cut China Reed (as an organic drainage layer), upon which freshly cut meadow is strewn? The meadow is cut strategically, such that flowers have been pollinated but seed has not yet dropped. Placed on the prepared roof, the cuttings drop their seed and result in roof vegetation that is very similar to its source of origin. These green roofs are irrigated only in the event of drought during establishment, and otherwise left to develop of their own accord. As a result, they’re durable and very cheap! Absolutely, native species should always be given precedence when planning green roof installations and, equally, the system designs should reflect local conditions with reference to analogue habitats. Ideally, irrigation should be avoided as this only weakens the robustness of the vegetation, to say nothing of the associated sustainability issues. That being said, drip irrigation as an emergency back-up is a different story from constant provision of water. If the pioneering spirit is truly adopted for green roofs in new places, then it should be taken on fully. Substrate composition, depth and nutrient specifications should be based on the native communities we wish to mimic. Irrigation should be considered in this light, too. That being said, the German and the Scandinavian pioneers experimented with their native flora and the reason Sedum and Dianthus species are so popular is that they are successful species chosen from the Sedo-Scleranthetea, one of the Central European plant communities chosen for trial. But here in New Zealand Sedum is a terrible invasive weed. Use of Sedum instead of using our species from our diverse local native flora is entirely wrong. There is a nonsense policy position taken by some designers that irrigation shouldn’t be used on green roofs, thus we see the failure of certain plantings on shallow substrates. But irrigation is an easy and sensible ‘insurance’ aspect to include on a green roof, it involves careful application of only a tiny amount of water, and enables more appropriate flora to be established. We’ve just had some research on barriers to green roof establishment. It seems there needs to be a planning requirement or financial incentive to get their proliferation. Good to see your blog Maria. 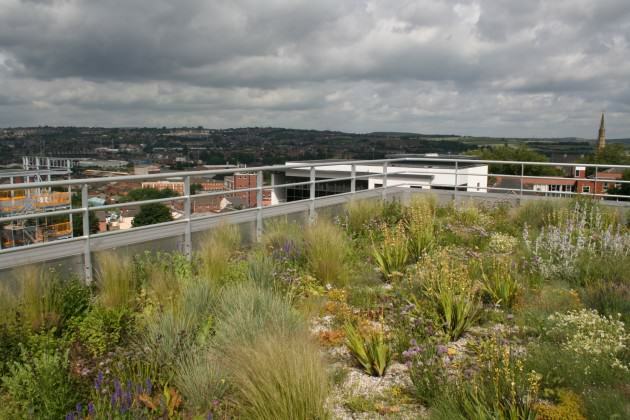 I’m pleased that green roofs for biodiversity are now becoming more accepted within the development industry. The question you pose is being answered in some places. London has a seed mix based on native species designed for green roofs ( the London Living Roofs Mixture) but there is still much to learn about the most effective ways of incorporating diversity within simple mechanisms akin to sedum mats. I’m impressed by the work done by Dusty Gedge and others to promote the subject. What we need now are detailed studies involving ecologists, designers and horticulturists working together to find solutions that are simple and practical; capable of being adopted widely by the industry. Its an exciting field that deserves rigorous research, not least because of the potential value in response to climate change. I hope your blog sparks some new initiatives.